Furthermore, there are nonvideo gamesâ€”a new breed of electronic battlegrounds emerging from game manufacturers who were never in the electronics business. Traditional game manufacturers like Parker Brothers (of Monopolyâ„¢ fame), Milton Bradley, Mattel Toys, and others now offer nonvideo hand-held or table-top electronic games. Consequently, these manufacturers blithely sidestepped the FCC and the production delays caused by Class 1 interference tests. The Electronic Industries Association estimates that some 3.5-million video games were sold last year. The figure for this year is expected to reach 10 millionâ€”and that is for video games alone; non-TV games are coming on strong, too. With figures like these, integrated-circuit chip suppliers such as General Instruments, Texas Instruments, National Semiconductor, and Rockwell are hard pressed just to keep up with anticipated demands. Then and Now. Atari got the videogame ball rolling across TV screens in a big way in 1975 with its “Pong” game, a hit-the-ball with a paddle game that featured automatic on-screen digital scoring. “Super Pong” followed, offering four resident gamesâ€”two forms of tennis, Catch, and Robot, all in full color with automatic scoring and sound effects. A host of other companies shared the success in this market, including Coleco and Magnavox, among leaders of “dedicated” games. Now these games are commonplace. Prices have dropped considerablyâ€”to as low as $19.95. Moreover, there are many more game variations available in a number of 1977-1978 models. Atari, as an example, has dropped its former line and introduced “Ultra Pong,” with 16 color-game variations selling for 40% less than last year’s more limited “Super Pong.” National Semiconductor’s “Adversary 370″â€”introduced last year as a tennis-hockey-handball gameâ€”has been joined by the company’s new “Ad- versary 600,” which has 12 action fields and 23 games that include “Pinball” and “Wipeout” (with 240 stationary targets) games as well as some of the traditional paddle-ball games. It uses NS’s MM57106 game chip, combined with an LM1889 Modulator IC to produce full color, audio and r-f signals. Magnavox’s “Odyssey 4000” has eight full-color games with remote, hand-held joysticks. Unlike most other paddle-ball games, users can move on-screen players in horizontal as well as vertical directions. In addition, an “Odyssey 5000,” with many more built-in games, is expected to be marketed. There are also video games that do not feature paddle-ball formats. For example, Atari has debuted a $79.95 “Video Pinball” game, a tank battle game, and a “Stunt Cycle” game. Most games provide a host of devices to make them more interesting, such as different paddle sizes, choice of ball speeds, etc. An interesting innovation this year on a few games is indenting the hockey-goal areas so that the puck can rebound behind the goal, as in the real-life sport. The major consideration here is to minimize eventual boredom. But a new generation of video games will surely overcome this possibility: programmable video games. 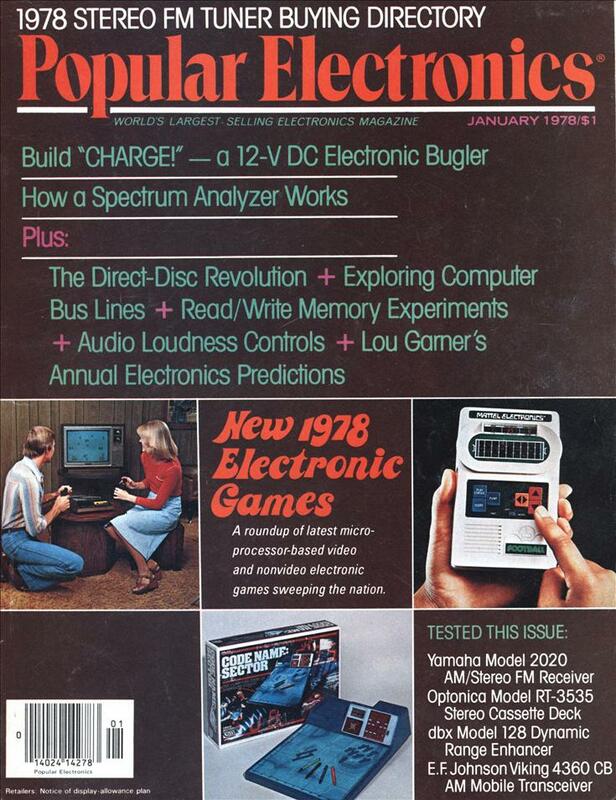 Fairchild Camera and Instrument broke the ice on programmable video games at the end of 1976 with its “Video Entertainment System.” Based on a reprogrammable microcomputer chip set, it spearheaded the format used by other manufacturers of programmable games. Here, one inserts what appears to be a tape cartridge (actually it’s a solid-state circuit that contains game programs on ROM) into a slot on the game machine to select a particular game or games in full color if played on a color TV receiver. Hockey and tennis are resident games stored in the machine’s F8 microprocessor. These games are disabled when a Videocart(â„¢) is inserted. There are 15 different cartridges available at this writing, including “Baseball,” “Desert Fox” (a tank battle game), “Shooting Gallery,” “Math Quiz,” and an introduction to “Backgammon.” The machine is priced at $169.95, while each game cartridge is listed at $19.95. The baseball game may be cited as an example of the degree of sophistication that microprocessor games can achieve. Here, a “green” team plays nine innings against a “blue” team. The player whose team is in the field can control the positioning of outfielders in order to “catch” the ball hit by the batter. Furthermore, he can pitch a fast ball, letup ball, slow ball, and curve ball in any direction. Balls, strikes, outs and runs register on screen. Hit the batter and a figure on the screen goes to first base. The score is automatically maintained on screen, of course. Clearly, the challenge of outfoxing one’s opponent makes the enjoyment of a game last that much longer. Following on the heels of Fairchild’s programmable video game was RCA with its “Studio II Home TV Programmer.” Whereas Fairchild’s game has remote controls, RCA’s features two calculator-type keyboards on the console, which measures 15″ long x 7″ wide x 2″ deep. There are five resident games: Bowling, Freeway, Addition, Doodle, and Patterns. Plug-in cartridges, of which there are currently six, also consist of ROM’s that plug into a socket. Built-in games are then disabled; players continue to control new games via the front-panel keyboards. Among the plug-in cartridge games available are baseball, space war, and “TV School House” (social studies and mathematics quizzes). The latter has a Yellow Series for elementary students and an Orange Series for advanced students. Both are accompanied by manuals to answer questions randomly selected by the Studio II computer. The faster the correct answer is selected and entered on the keyboard, the higher the score registered on the TV screen. The console is priced at $149.95, and cartridge prices range from $14.95 to $19.95 each, depending on contents. The RCA Studio II game is based on the CDP1802, the same 8-bit chip used in the Popular Electronics “Elf” microcomputer, as well as the black-and-white graphics chip. In addition, inside the machine are two 512 x 8-bit ROM’s. They act as an “interpreter” to provide common game-display patterns such as scorekeeping, alphanumerics and subroutines. A second ROM contains programming to execute any of five resident games. TV refresh (direct-memory access or DMA is used), and stack and variable storage are provided by 512 bytes of RAM. Bally, well known for its arcade games, has entered the consumer electronics market with a programmable video game called, “Professional Arcade.” The model has two on-board games called “Gunfight” and “Checkmate,” with controls for up to four players. In addition, it incorporates a 4-func- tion, 10-memory printing calculator with a screen display, entry correction and scroll button. A cassette mode permits plugging in “Videocade” electronic programs, which consist of an Action/Skill series, a Sports series, an Educational series, and a Strategy series. This programmable machine also features music. For example, in “Gunfight,” the user operates the movable arm of a computer-generated “cowboy” to aim and fire at an opponentâ€”assuming he is not hiding behind a movable cactus. If the player “Kills” the opponent, the latter dies on the screen to the sounds of “Taps” and “The Funeral March.” The Arcade is priced at about $290, while cassettes are $20 each. At this writing, the model is awaiting FCC type approval. Coleco Industries, Inc. also has an “Arcade” programmable game on the market. It’s called, “Telstar Arcade,” and features a three-sided console. One side has a built-in car steering wheel that acts as an input controller for auto racing games, another a pistol and holster for target and shooting games, and the third a set of knobs for paddle games such as tennis, hockey, etc. Games are determined by the programmed Telstar cartridge used, which is triangular in shape. The unit comes with a cartridge that contains programming for three games: “Road Race,” “Quick Draw” and “Tennis.” The console with one cartridge is priced between $100 and $125 at this writing, while other cartridges (unannounced) will be priced at $20. No TV Needed. Games that do not require a TV receiver have begun to enter the electronic-game market in force. Milton Bradley, for example, has introduced a hand-held game incorporating a microprocessor, called “Comp IV.” When the $30 game is first switched on, it selects one of 32,000 random-number combinations. By using the keyboard, a player enters his number guesses. LEDs display how close the player’s guesses are to the game-selected number. The idea is to logically deduce the numbers and their order in as few tries as possible. Comp IV can be programmed to operate with three, four, or five number strings to make the game as easy or as simple as one likes. This MB game is built on a single board that utilizes a multikey keyboard and a Tl 970 game chip. (The 970 is actually part of the new Texas Instruments TMS1000 series of p-channel MOS four-bit microprocessors. During its manufacture, however, a masking technique is used to program an on-board 1-k ROM that tailors the TMS-1000 to fit a customer’s requirements in software and allows direct-drive for displays. The chip also supports 256 bits of RAM and an arithmetic unit.) 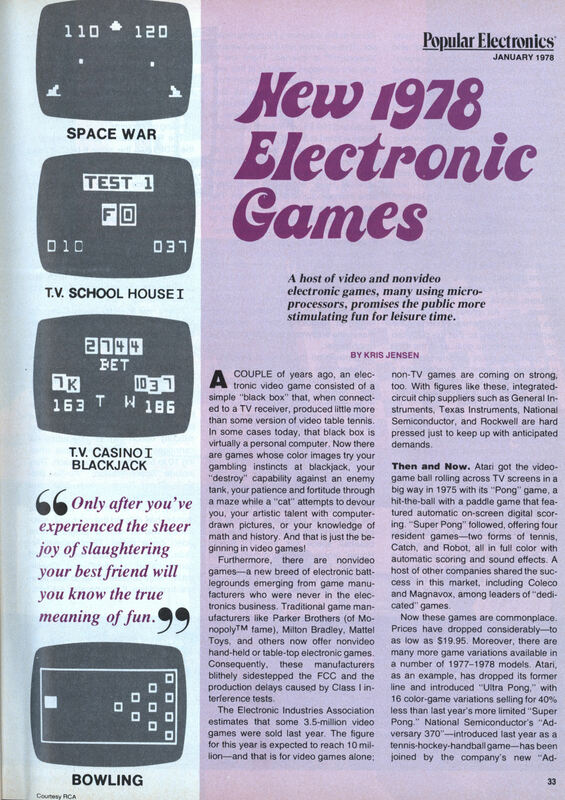 Milton Bradley was not alone in see- ing the value of a microprocessor for nonvideo games. A Tl system is also the integral component in “Code Name: Sector,” a submarine pursuit game from Parker Brothers. This game is truly challenging. Two opponents compete against each other, each commanding a destroyer in an effort to sink a computer-controlled sub as it moves through 4800 possible sections of a nautical-chart board. Seven-segment and discrete-LED displays indicate speed, depth, range, and headings (directions) as opponents try to blow the sub out of the water. Collisions can occur to throw a player off course, and if a player misses the sub, the underwater craft not only moves on a secret course, it will fire back to put the attacker in a random position out of firing range. Though “Code Name: Sector’s” instructions are stored in ROM, a RAM, system is used to temporarily store information on ship positions, compass headings, and speeds. Decoding for the displays is accomplished with a programmable logic array for conversions from BCD (binary coded decimal) to seven-segment format. A Klixon keyboard from Tl is used to input information such as speed, steering, sonar control, etc. The entire system operates on a single 9-volt battery. It’s priced at $40. In playing “Auto Race,” you are racing around a four-lap LED-lighted course. Steering and speed/shift controls allow you to maneuver around opponent cars under the game’s control. While playing, motor sounds are produced. You hear a beep to indicate a collision; a victory sound when and if you beat the seven-segment clock through the course. In “Missile,” a LED array indicates that enemy missiles are launched toward your “city.” The object of the game is to use your anti-missile missiles to destroy the enemy missiles before they reach home turf. A seven-segment display keeps track of your “kills,” but make one mistake, letting an enemy missile through, and the game plays “Taps” just after your city is destroyed. The display is what makes the Mattel games unique. It is a cross between a hand-held calculator number display and a true video display, minus the video. Designed by Rockwell International, it consists of a matrix of 40 x 10 mil GaAs LED’s. Three columns of seven vertical line segments make up the Auto Race and Missile Attack displays, while three rows of nine horizontal segments make up the display for the Football field runners. All multiplexing and buffering is accomplished with Rockwell’s PPS-4/1 microprocessor. This dedicated chip contains all the software for all three Mattel games. Cost of these is $29.95 for Football, $24.95 each for Auto Race and Missile Attack. Rockwell is also responsible for the design of another system, sold by Unisonic. Called the “Unisonic 21,” it is a Blackjack card game that comes in both shirt-pocket and desk-top models. If you would like to calculate your odds before picking up the next electronic “card,” you can flip a switch that converts the game into an eight-digit, four-function calculator. Taking its game more seriously, Fidelity Electronics has developed the “Chess Challenger.” It uses four alphanumeric displays and a keyboard. Moves are entered via the keyboard and shown on the displays. Two seconds later, the display indicates the machine’s move. An average player will win 25% to 70% of the time in which case, a LED labelled “I LOSE” indicates the machine’s defeat. With the “Chess Challenger,” you move real chess pieces around a real chess board. (The chess board does not use the standard chess-square identifier terminology. Instead, the terminology is unique to the computer logic system around which the game is built.) “Chess Challenger” employs a standard 8080 microprocessor chip, a ROM system for strategy storage, and a RAM system for game moves. The game sells for $200 (Heath sells it for $179.95, assembled), and for an extra $75, it can be reprogrammed (another ROM installed) for tournament strength. The upgraded version begins a game by asking at which level you would like to play. You can begin at level 1 and, as you become more proficient, work up to level 3. The game level approach is also used by Staid’s “Compuchess,” another chess game recently introduced. The $159.95 hand-held game requires you to supply the chess board. It can be programmed for up to six different skill levels. Levels 1 and 2 are for teaching purposes; levels 3 to 5 are for players already familiar with the game. Because of all the algorithms performed at level 5, it takes the game nearly seven hours to respond to your move. Hence, levels 5 and 6, which require a couple of days to respond, are for the chess-by-mail addict only. Yet another computerized chess gameâ€””Boris” from Applied Conceptsâ€”is a $299.95 machine designed with both beginner and advanced chess players in mind. It features a programmable starting position, handicapping, en passant, castling, automatic queening, editing capabilities, timer, and an 8-digit alphanumeric readout. The computer concedes defeat by flashing “Congratulations” on the display. The increasingly popular game of Backgammon has not been neglected, either. “Gammonmaster II” by Trycom Inc. and “Computer Backgammon” by Texas Micro Games, Inc. have both been announced and exhibited at shows. In both cases, the computer is a real thinking machine, being required to analyze the entire board before making its move against its human opponent. National Semiconductor has not confined itself to the pure video game market. Based on its calculator-oriented processor system (COPS), NS has three versions of a learning game called QuizKid. The hand-held games present math problems of varying complexity and require answers within preset time limits. The latest QuizKid Racer game can operate as a single unit, or it can be linked by a cable to another Racer game to allow two opponents to challenge each other while competing against the machine. The COPS series includes two single-chip microprocessors, the MM5799 and MM57140, 8 or 16 k of ROM, 1 k of RAM, and other IC’s, including a printer interface chip. The hand-held game, as a teaching aid for children, could prove an important tool in child education. Other manufacturers, such as Texas Instruments and APF, are also beginning to produce such games. Still Many More. The number of manufacturers who produce electronic games seems endless, thanks to a steady stream of totally new chips being offered as off-the-shelf items to them. Tl, for instance, has Space War, from its new line of game chips. Gl has its “Gemini TV Games” IC’s, which include cassette-programmable IC’s designed around a CP1600 microprocessor and a system instruction ROM (2048 x 10 bit). With appropriate RAM’s and graphics processor chips, games such as “Road-race,” “Submarine,” “Dogfight,” and “Blackjack” can be generated. The most widely used Gl chips employed by game makers are the 8500 and second-generation 8550 n-channel MOS devices. With just a few outboard components, these chips can provide tennis, hockey, handball, practice, and two target games, the last with remote guns. On-screen scoring with sound effects are generated by the chips, as are color outputs for use with a color-generator circuit. It is this flexibility that has made the Gl chips so attractive with such manufacturers as Magnavox, Lloyd’s, Monteverdi, Venturi, Hanimex, etc. Simply jumpering or switching certain pins of the 28-pin IC adds as much complexity (and cost) to the final product as desired. Speaking at last year’s winter Consumer Electronics Show, Dr. E.A. Sack, Vice President for Gl, stated that his company believes in the dedicated approach to microprocessor game designs. Gl backed up this position by introducing its Gemini video game circuits that are capable of playing more than 50 different games. While some of the new chips allow a manufacturer to make stand-alone games that can be reprogrammed, others can be added to existing games that use the Gl 8600 eight-game chip (tennis, hockey, soccer, squash, practice, gridball, basketball, and basketball practice). Using much of the 8699’s video and player-control circuits and adding an 8603 chip, for example, the normal ball-type games can be transformed into a road race when game number 1 is selected on the control switch. The idea, of course, is to allow a manufacturer to upgrade his entire stock easily and relatively inexpensively simply by adding one IC chip. Gl has just recently begun delivery of its AY-3-8700 single-chip tank game. This is a 28-pin IC package that provides 32 rotational angles of tank control for two players. Video outputs from the chip include left and right player tanks, shells, shell bursts, mines, fixed barriers, score, blanking, background, sync, and color-burst locator. Audio output circuitry is just as complete with tank-1 and tank-2 motor sounds, bearing and track squeals, and explosion and gun-fire envelopes. The chips are $9.95 each, but don’t send in an order unless it is for 50,000 or more chips. Among other companies in the electronic game business, APF Electronics has a broad line of video paddle games with two new additionsâ€”the Model 500 with 20 space-type games, including Space War, and an M1000 microprocessor programmable game at $149.95. Microelectronic Systems’ “Interact” is a joystick-and-keyboard-operated game that can be programmed by a tape system. Running at 810 bits/inch, the tapes set up the game to play Trail Blazers, Blackjack, or Regatta racing. You can also draw computerized color pictures on a TV screen. With a built-in cassette machine and alphanumeric keyboard input, it lists for $249. Even though game manufacturers are now designing games for the home, office, and shirt pocket, this is just the beginning of a whole new era of gamesmanship. Datatime Corp. may be saying this with its new wristwatch, which gives time and date on a liquid-crystal display as well as allowing you to play Jackpot, Dive, and Roulette. A backlighted display on the $100 timepiece keeps you in action no matter what the hour. Too, let us not overlook the home computer while we’re exploring electronic games. Though computers are at the peak of the triangle in terms of numbers expected to be sold this year (owing to higher costs), a myriad of fun games can be played on a TV screen if you have your own computer. There are more possibilities, in fact, than any programmable-type video game has because you can create your own game programs as well as having access to an overwhelming amount of game software and written programs. I use to have item “C”…….. it was great. When I was in 5th and 6th grade (1978-1980), Mattel’s handheld games were the hot toys to bring to school. At recess, kids would hang around the hallways playing Electronic Football, usually with a cluster of onlookers marveling at the electronic wonder. I was in Jr High, but I remember special rules bing implemented for Mattel Football the way schools, churches, etc. have rules for cell phones now. Give me a couple hours and an Arduino board, and I can create one in my home office. Those were great times to be a kid. I totally forgot about that Mattel Electronics Racing game. By the time that genre petered out (82-83), I had about twenty of those games. Man, and I forgot that I even had the Omni IV until I saw the picture of it! I had the Chess Challenge too but hated the fact that it wouldn’t let me castle my rook. And the same for the “Missile Attack”. Oh wow, I remember getting the Mattel Auto Race game 30 years ago! Whenever the battery got really low, the game would accelerate to, hmmmm, 3 seconds in duration. It didn’t’ last long but was most amusing! Please email me at [email protected]… if interested or if you know of a firm interested.